Lucy Jade Sylvester's jewellery is inspired by the British countyside, basing the exquisite pieces on natural elements found near her Oxfordshire home. "I walk in the countryside to collect delicate seedheads and insects. I am interested in finding things that would decay into the ground, turning them into precious wearable objects. With climate change affecting our wildlife, my work may become a record for the future of the insect and plant life we have today." 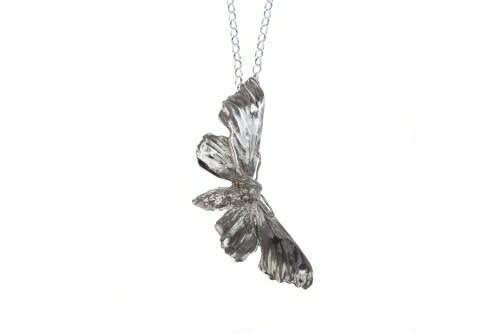 Lucy creates strikingly beautiful collections using semi-precious stones and peacock pearls together with finely detailed pieces in oxidised silver of beetles or bumblebees, plant stems or sycamore seeds.